I contacted several places before finding Geoff, and nobody would drive 20 miles outside of CB, unless you were buying something new. My dryer had quit heating and close to Christmas when you are expecting family to visit, I was about to give up. Thank You so much Geoff for going above and beyond to come out to Neola IA on a Sunday to help me out, I appreciate it more than you know! Upon moving to this area, we discovered that running a dishwasher after it has sat idle for more than a year breaks a dishwasher. Our repair-person search led to Mr. Atchley, who explained this over the phone, "Save your self the service call, and just go get a new one." Fair enough. That's what we did. We appreciated this opinion and savings, so when our dryer began squeaking so loudly we couldn't hear ourselves think . . . CB Appliance was our first call. It took some work, but the dryer again does it's job with minimal complaint :) Fast forward six months, and the the self-clean cycle on our wall oven rendered it unable to heat. Online research (and family input) provided a resounding, "You'll have to replace it; that cannot be fixed." So, we waited the summer then called CB Appliance--not only was it easily repaired, we spent $100 instead of the $1,000 we imagined! 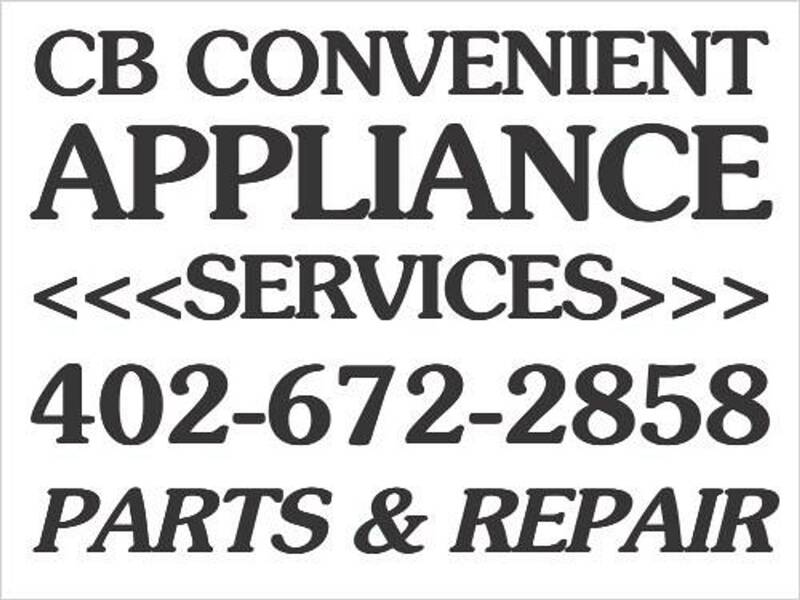 Most recently our washer needed help, and is now back to it's old self thanks to CB Convenient Appliance Services. I just wanted to say thank you very much for the excellent service you provided us today. Good customer service is hard to come by these days and you are top notch. You are professional, courteous, knowledgeable, honest, affordable, had a great response time and superb communication. We will definitely be keeping your number handy for the future and would highly recommend you to anyone in need of appliance services. Thanks so much for providing an excellent service and being so easy to work with. I contacted Geoff after having experienced a "no show" from another appliance repair store. He contacted me immediately. He also attempted to give me some ideas to try without making a trip out. Those all failed, but I sure appreciated that he was trying to help me. He came out this a.m. (Sunday) and had a tough job to do (front load washer- painful repairs). He fixed our washer and we are back in business! If you need someone who is trustworthy, kind and capable, CB Convenient Appliance Service is who you need to call! 5++++ Stars! I left a voicemail for Geoff and he promptly returned my call. In addition, he fit me in for service on my Speed Queen dryer the very next day.. Geoff was able to access my dryer situation and figure out the problem pretty quickly- what impressed me, is that he took the extra time to literally check EVERY aspect of the dryer to make sure there were no other issues. Geoff is very thorough and he made suggestions to help my dryer work better in our environment. I highly recommend Geoff and CB Convenient Appliance Services. Geoff--thank you for your generous and knowledgable assistance with a GE part no longer available. You provide a very unique service by sourcing these parts, then making them available to those of us with vintage appliances. It is my personal opinion that more of us in America will do more repair and restoration (and less throwing away). Maybe we will even, once again, manufacture appliances that can last! Now, I may still give you a ring if I have trouble installing this part; you see, most vintage owners are likely DIYers! All the best. And you must let me know if ever I can return this good fortune! Thought I'd never find this part! © 2019 Appliance Parts & Repair in Council Bluffs IA. All Rights Reserved.